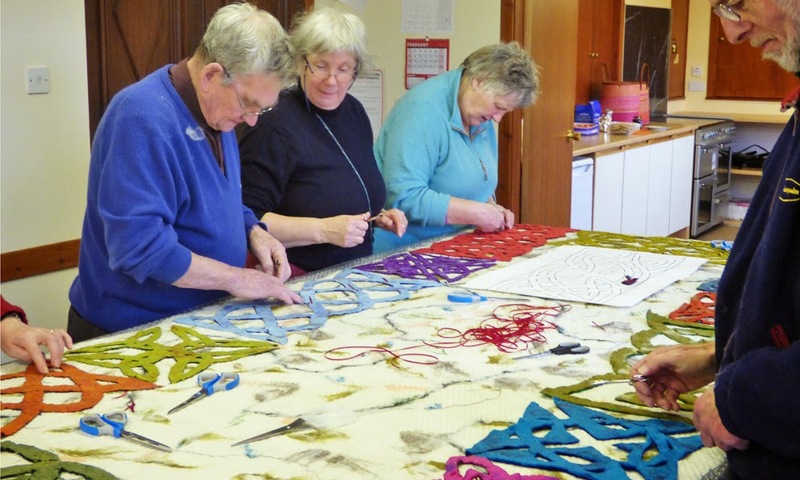 This post is about the making of the second of 5 wallhangings being made on the Black Isle as part of a project for Groam House Museum's Outreach Programme. 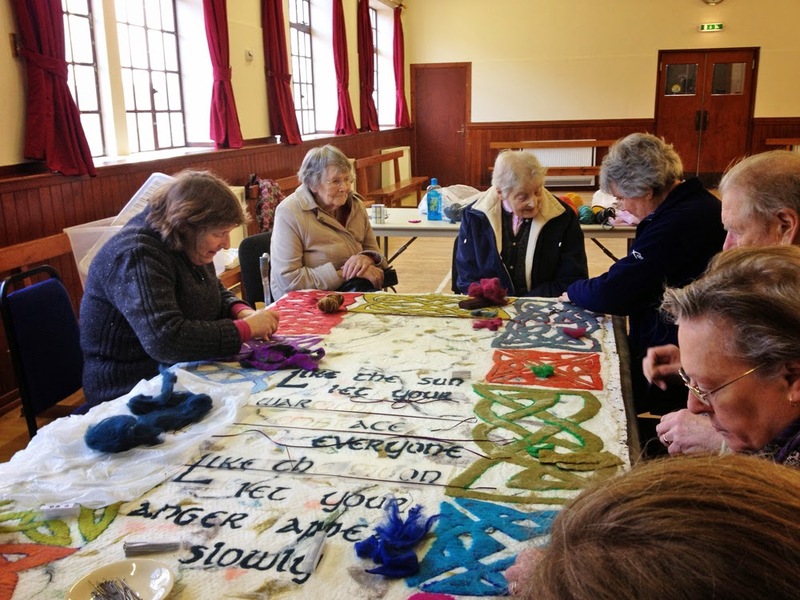 Each large felt wallhanging is being made by a different group of people but all to the same theme. 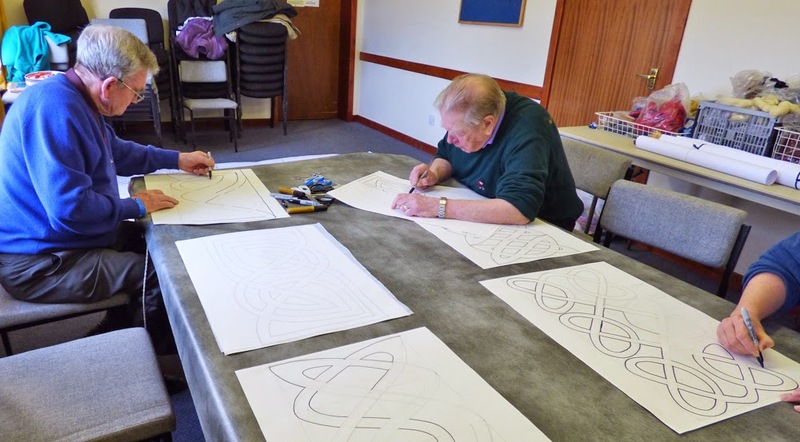 They are inspired by the work of George Bain which is housed in the museum and also by the Pictish stones of the area - from which Bain took much of his inspiration. The day dawned bright and fair and I got the car all packed up with my fibres and equipment and headed over to Resolis - the name means "sunny slope". Once everything was unloaded, the new recruits from the friendship groups started to appear and we set to work. 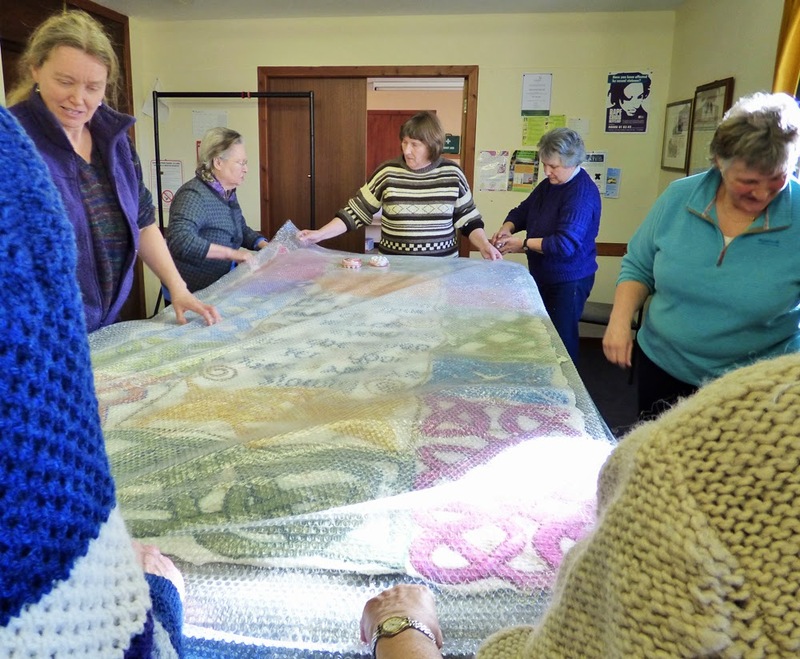 The first thing was to explain what we hoped to achieve - it was easier this time round because I had the benefit of the finished wallhanging from the previous group. You can click here to read about how the first one was made. Then it was down to choosing colours. Each person chose two - one dark and one bright/light to contrast with it. As there are lots of colours to choose from, this took a fair amount of time. 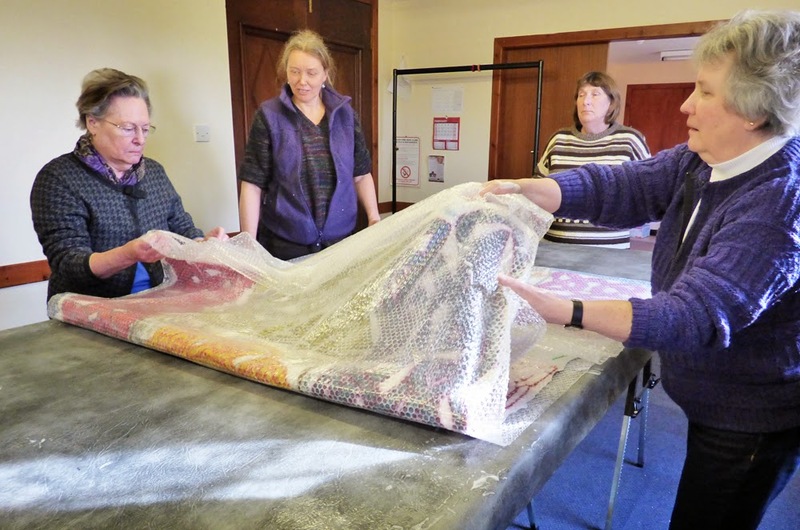 Then, we laid out bubblewrap and started laying down the darker fibres. 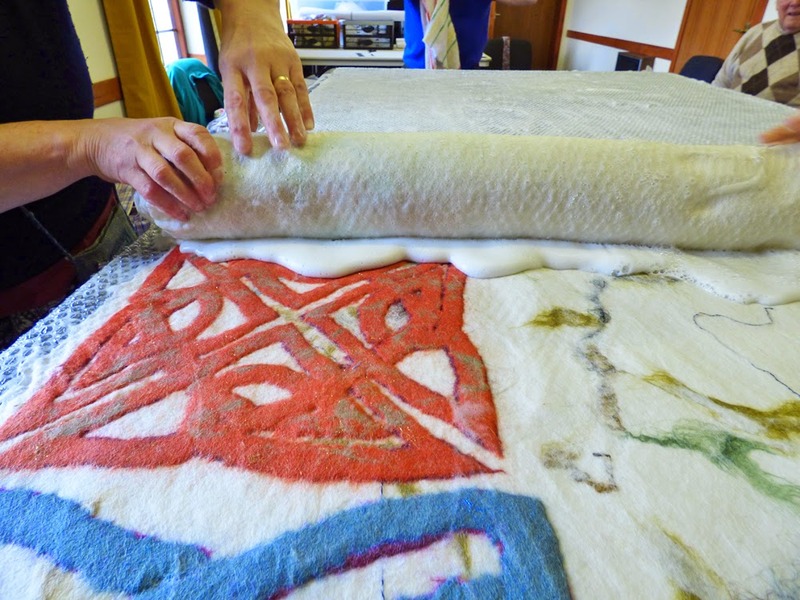 Then the second layer went on top with the fibres running at right angles to those of the first layer. 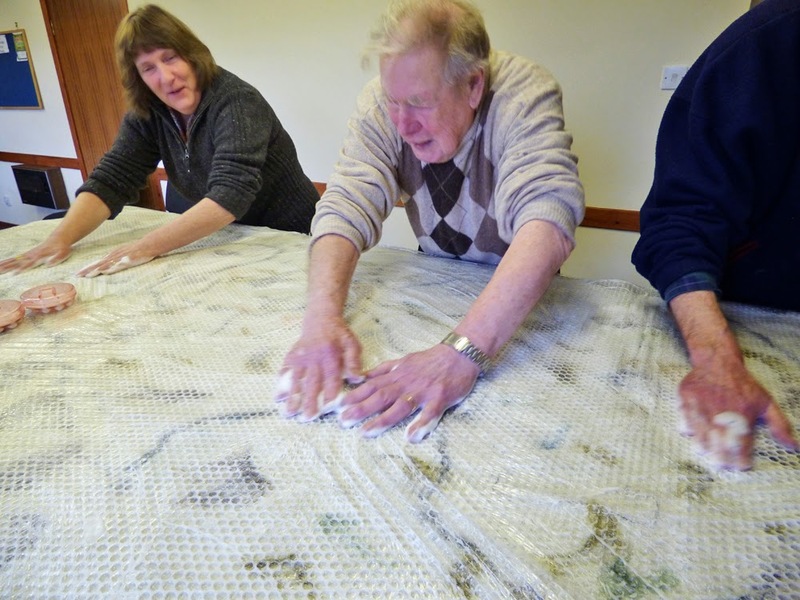 Then, unused fibres removed from the table, we poured soapy water over the fibres and laid another sheet of bubblewrap on top. 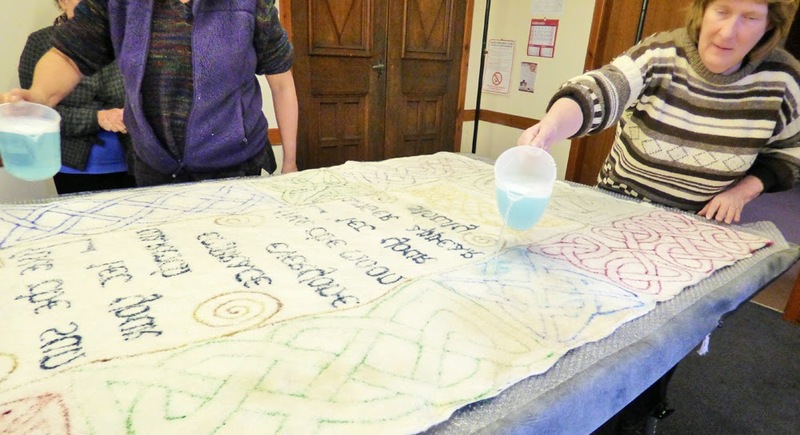 First we pressed to spread the water through the fibres, and then we started rubbing. We didn't have quite enough space around the table - so Wendy was relegated to the kitchen! She helped with the previous wallhanging so she knew what she was doing and was quite happing pottering away by herself. Throughout the day I was taking loads of photographs - far too many to show here, so I have put them all onto a web album which can be accessed by clicking here. 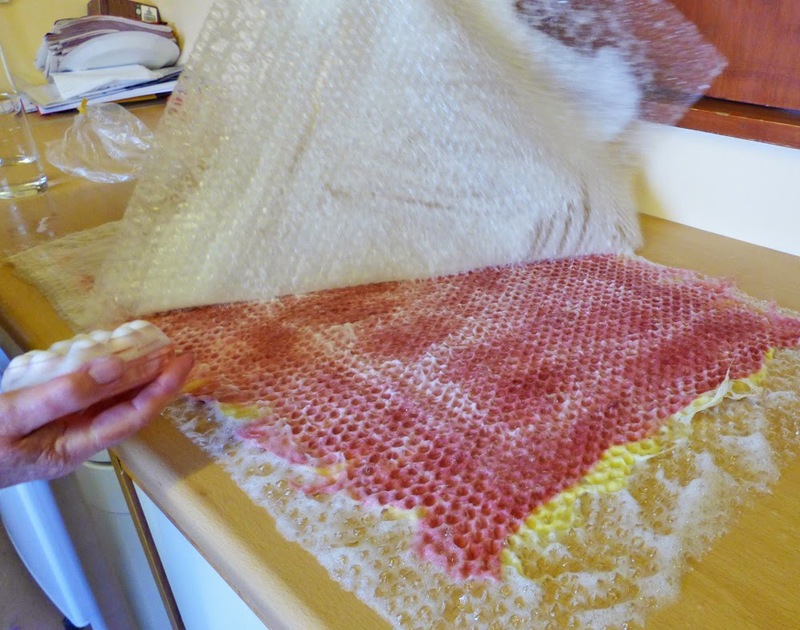 After a few minutes of rubbing, we all turned over our bubblewrap & felt sandwiches and started rubbing from the other side. 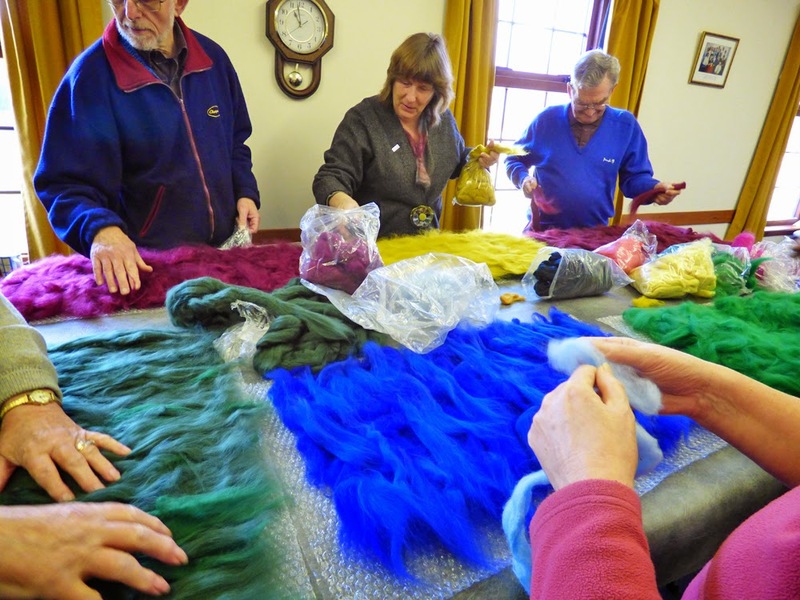 At this stage, we were just making "half-felt" - this involves felting just enough to hold the fibres together to allow us to cut out shapes, but for the fibres still to be loose enough to be felted onto a background piece which we would make on the next day. 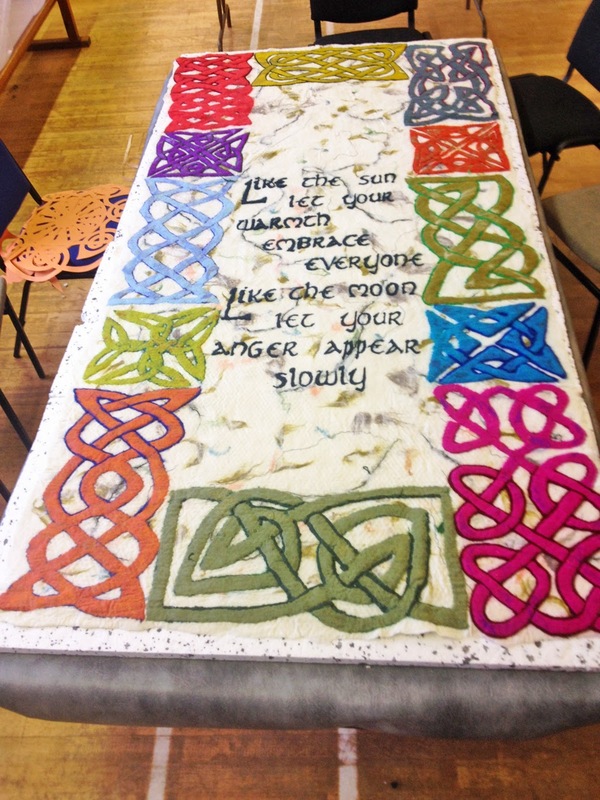 We needed 4 more pieces of felt to have enough for our design, so some went through to the kitchen to work on these while the rest of us lowered the felting table to sitting height, dried it off and started tracing through our designs. I had prepared these knotwork designs earlier but they were all just drawn in pencil so first we went over all the lines with a black pen. 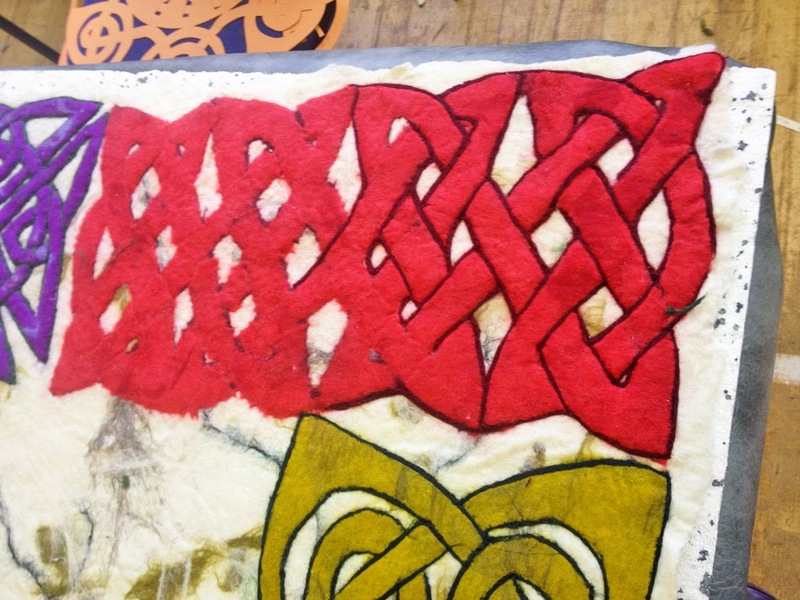 Then we traced these through onto a special fabric with a waterproof marker pen. 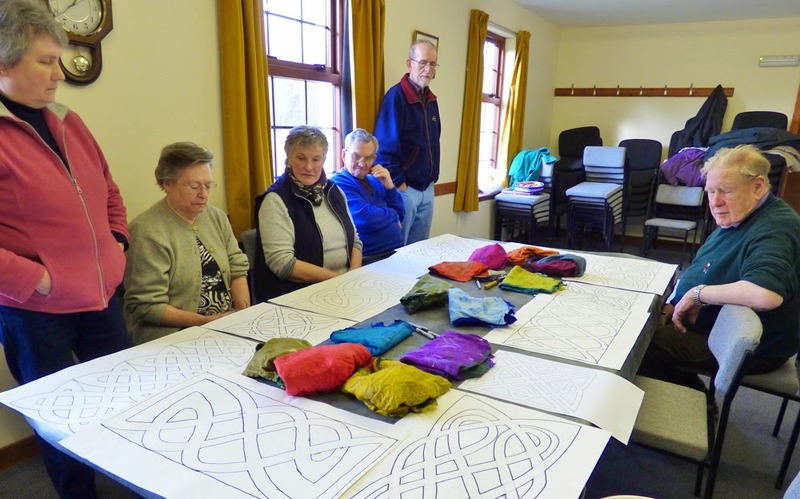 Once all the designs were ready, we laid them all out in position on the table and allocated different colours for each design. 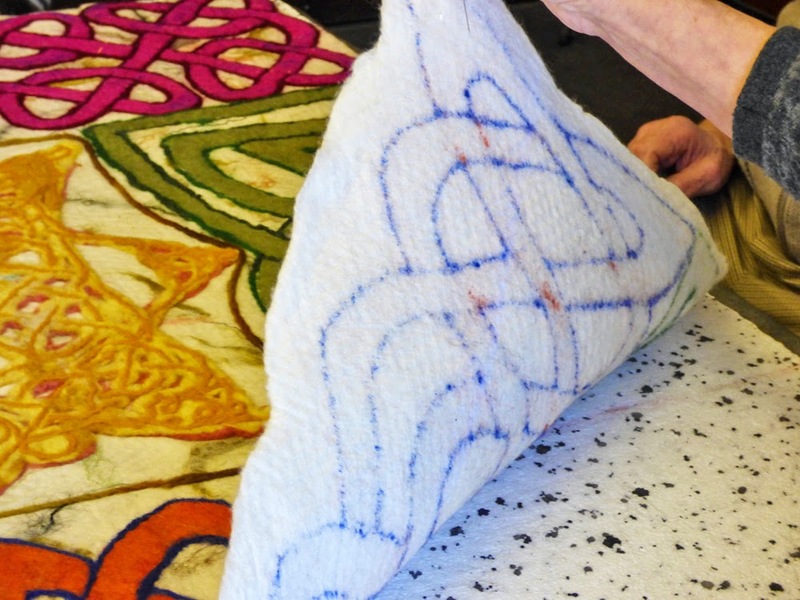 Then we flattened out each piece of felt and pressed our tracings in position to use as a guide for cutting out these intricate shapes. Cutting out took most of the afternoon as we were trying to be as careful as possible. By the end of the day it was all ready and we were able to lay out all the cut pieces on the master plan. Of course we changed our minds about what would go where, but eventually we had it all arranged to our satisfaction. A wild day this time - very windy, but some sunshine in amongst the squalls. 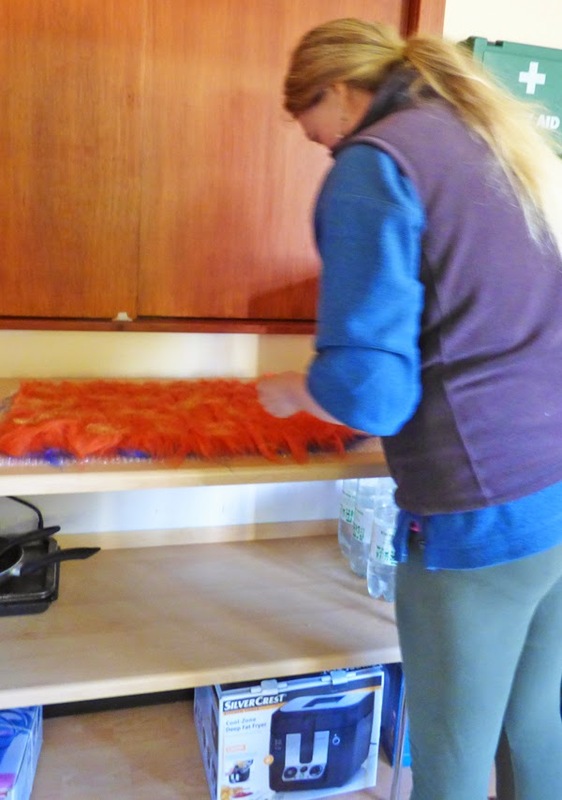 The table was quickly set up at standing height, covered with a layer of bubblewrap and on top of this a layer of icewool. This helps to give strength to the wallhanging and means that there can be no danger of thin parts. 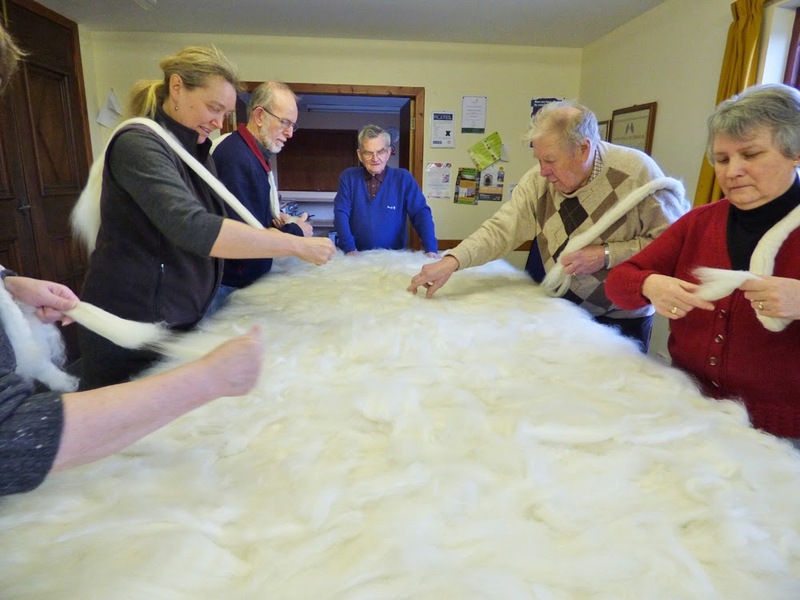 Then we started laying down white merino wool fibres starting in the middle and working outwards. 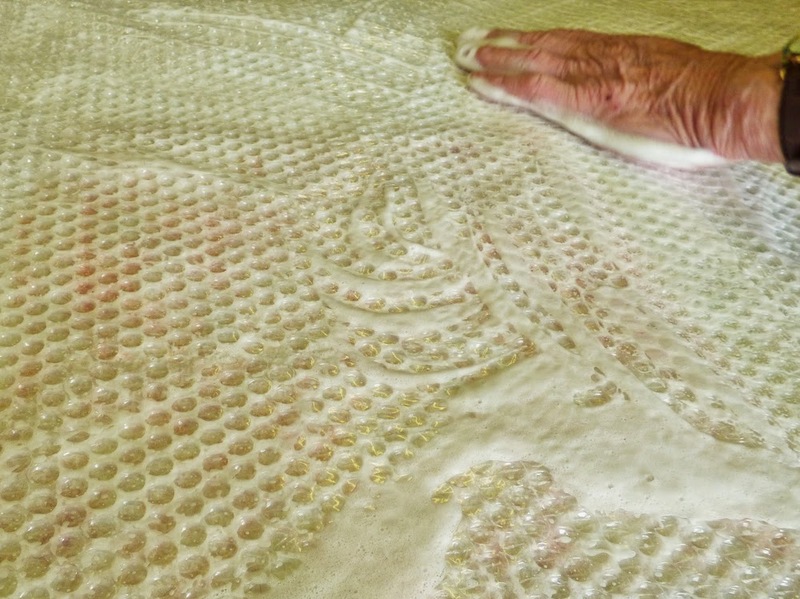 Once the first layer was complete, we started on a second layer, with the fibres running perpendicular to the first layer. This is trickier when you are putting white on white - not so easy to see where you have been, so once we thought it was all okay, we went over it with our fingertips searching for thin spots. Next part was more fun - adding some decorative bits and pieces to add some interesting texture to the surface rather than just a bland white sheet. 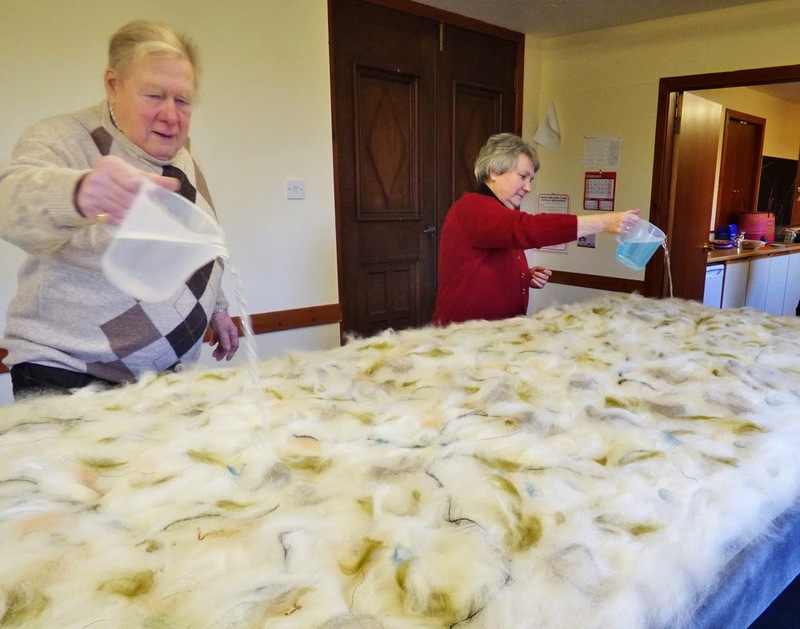 I had brought a selection with me - mohair yarns, silk fibres, bamboo fibres, goat hair, shimmering nylon, wensleydale curls plus a few other pale shades of merino fibres. Each person chose a different thing and we rotated around the table adding our bits and pieces. Much more interesting than just white! Then, we wet the whole thing down with warm soapy water - lots of soapy water! It took about 10 litres of water to wet down our 4ft by 8ft area of fibres. 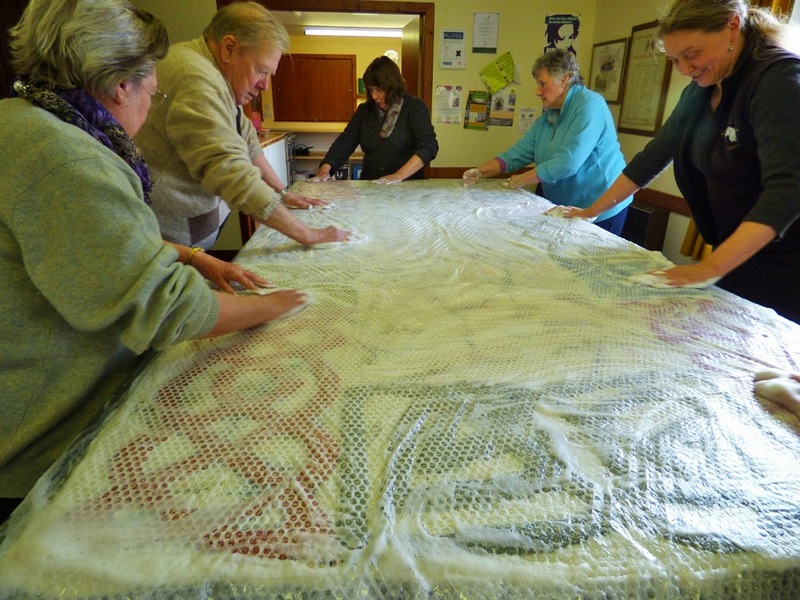 Then it was covered with another sheet of bubblewrap and the hard work began. We spread out the water until everything was wet and then started rubbing....... and rubbing.........and rubbing. This part is where it really pays to have a group of people working together - especially with someone like Clive on the team. He has a long reach and big hands - and covered twice as much area as everyone else! Not only was he great for rubbing, but he had baked a delicious fruit cake and we all enjoyed our break! 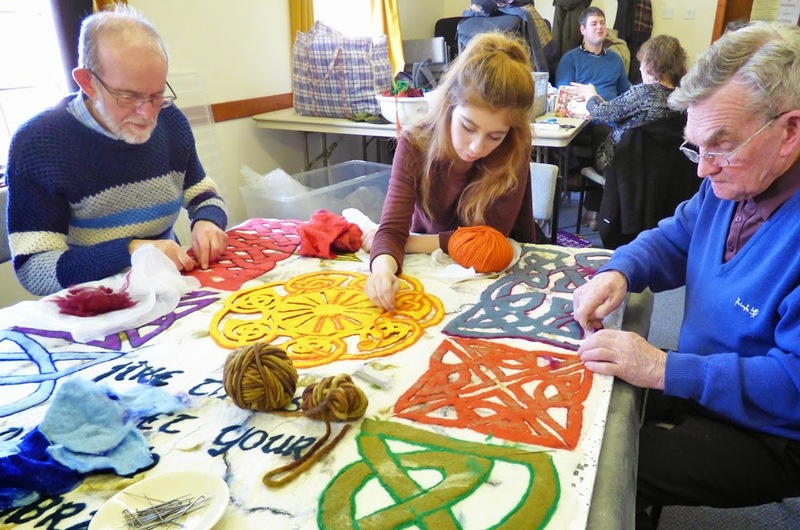 Suitably refreshed, we positioned our cut-outs from the previous session and then started snipping through the top layers to expose the darker colour at each intersection in the knotwork. 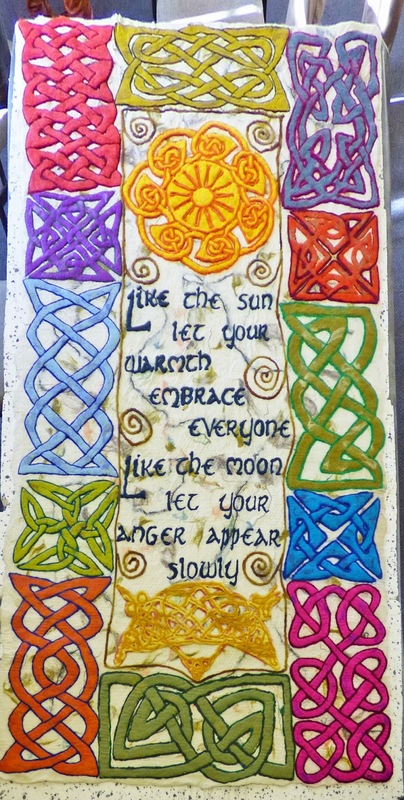 This helps to give the impression of the "overs & unders" which are typical of Celtic knotwork. Then, bubblewrap back on and more rubbing - this time it had to be really serious rubbing as we had to get the cut-out pieces to felt onto the background felt. For this stage, it is good to get everyone to move around the table. 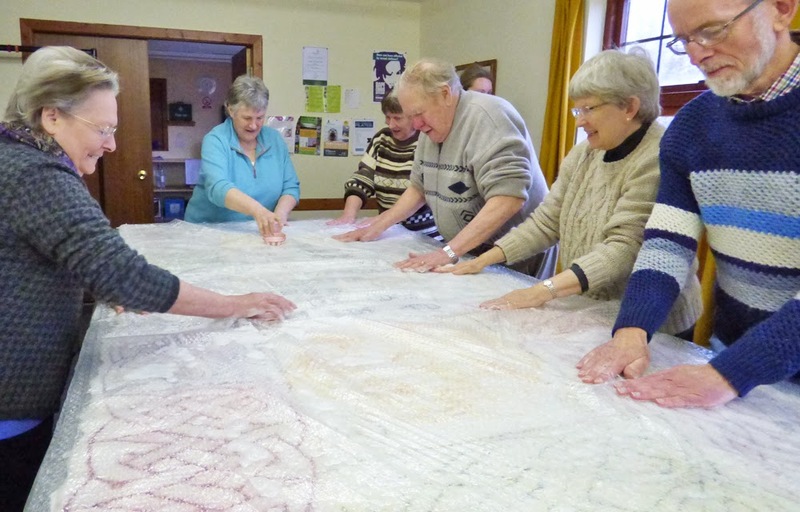 Everyone rubs differently and covers a bigger or smaller area with their movements, so every few minutes, we all moved one position to the right until we had all done a circuit of the table. Then we turned it over - another task where teamwork comes into its own! 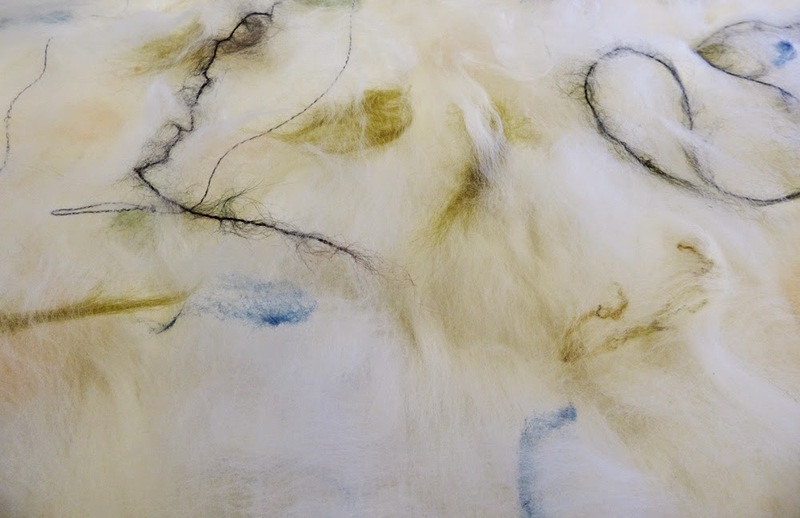 If you look carefully, you can see some of the coloured fibres shining through the white - a sure sign that the felting process is working with all the fibres tangling up on each other to make a strong piece of fabric. 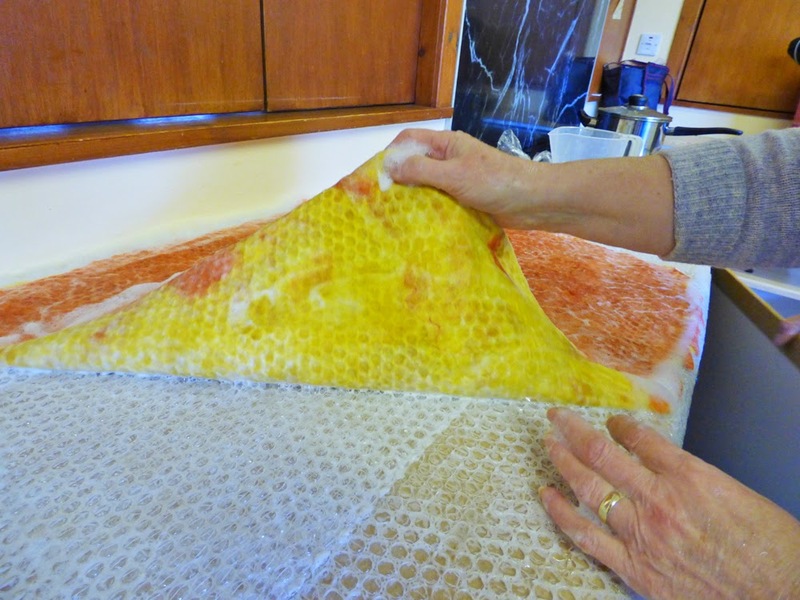 After about an hour of rubbing on the front and then the back, we took the bubblewrap off and did a bit more rubbing without the bubblewrap - first on the back since that was the way up that the felt was, and then we turned it over and did the same on the front. This was a good way of ensuring that all the cut-out pieces were fully felted onto the background. 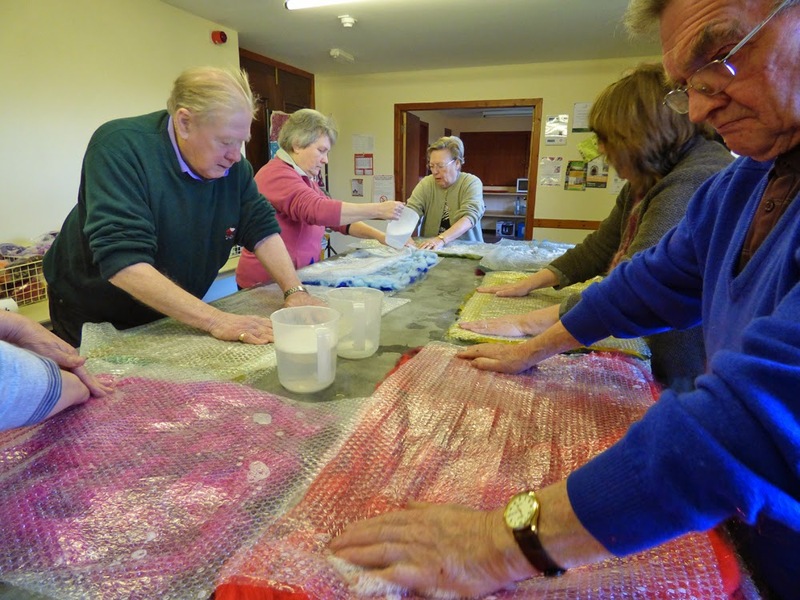 Then the final task of the day was to roll up the felt and squeeze out as much of the soapy water as we could. Towels and basins to the ready! And then it was time to pack up and go home. Another blustery day. This time the table was set up at its lowest position to make it better to sit at. The task for the day was needlefelting. On the previous day we had agreed on wording for the centre panel and I had come with stencils cut out ready for us to use. These stencils are sheets of translucent vinyl. 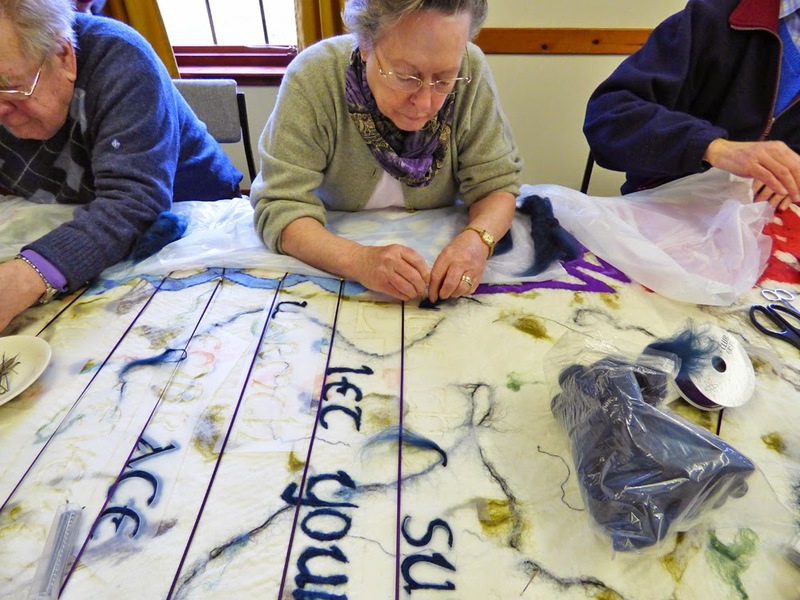 We pinned lengths of ribbon onto the felt to make a baseline for the text and then started needlefelting dark green fibres though the spaces. 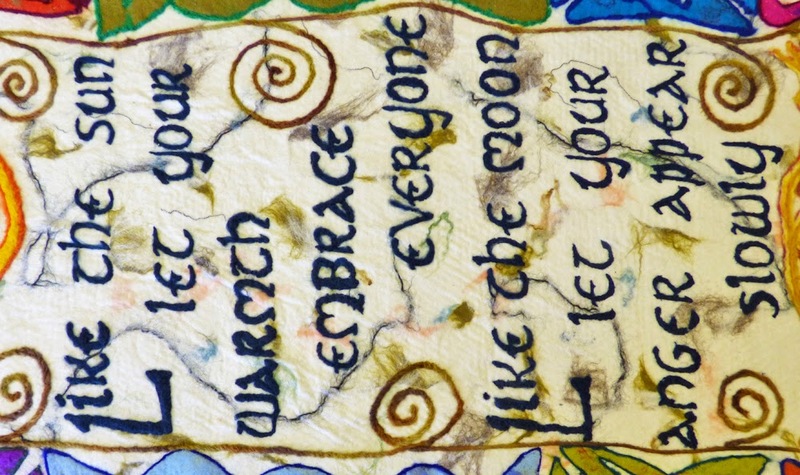 "Like the sun, let your warmth embrace everyone. Like the moon, let your anger appear slowly"
We needed two more pieces of half felt. We had decided that the space above the should be a motif based on the Pictish sun disc symbol and the space below would be filled with the crescent and V-rod symbol - which many believe represents the moon, though in truth nobody knows for certain what these symbols means. 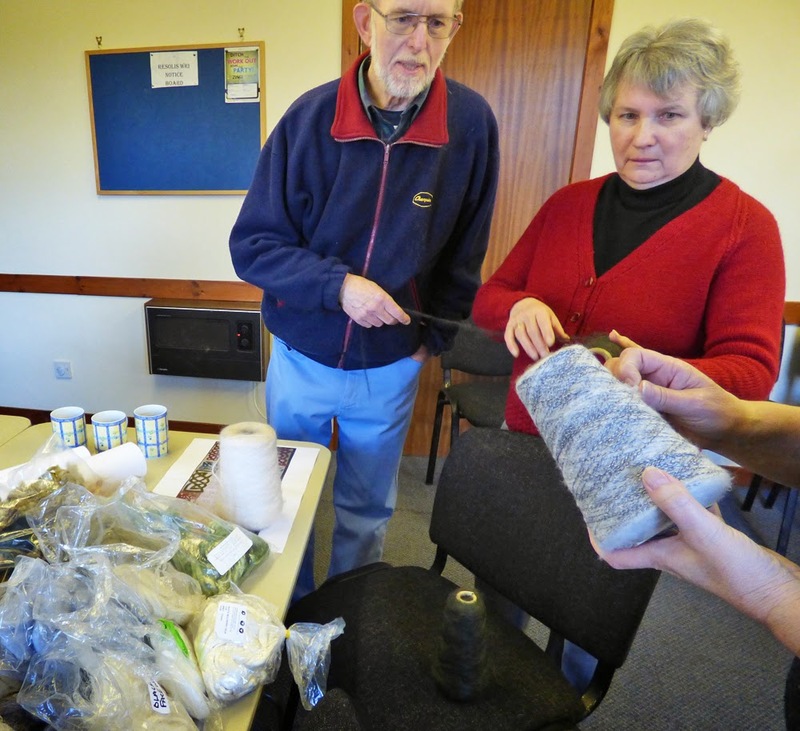 The two pieces of half-felt were made in the kitchen while the rest of us got on with the needle felting. We went through quite a lot of needles while people got used to the method. Because of the area we were using expanded polystyrene as our base for needle felting. To get this area of polystyrene involves using builders quality - good in terms of it doesn't disintegrate too quickly while you are working, but it des have the odd hard lump that makes it difficult for the needle to penetrate and causes breakages. However - I had brought a good supply with me and we were not in danger of running short. 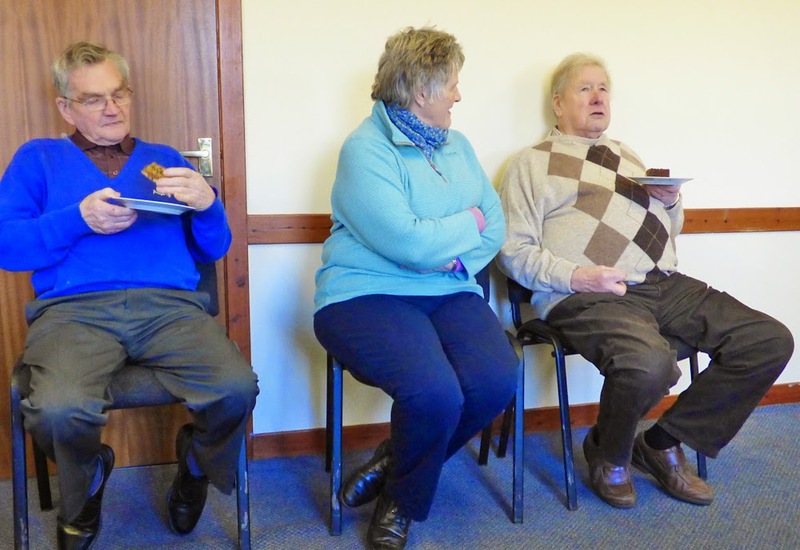 Clive had baked another cake so we had a teabreak! 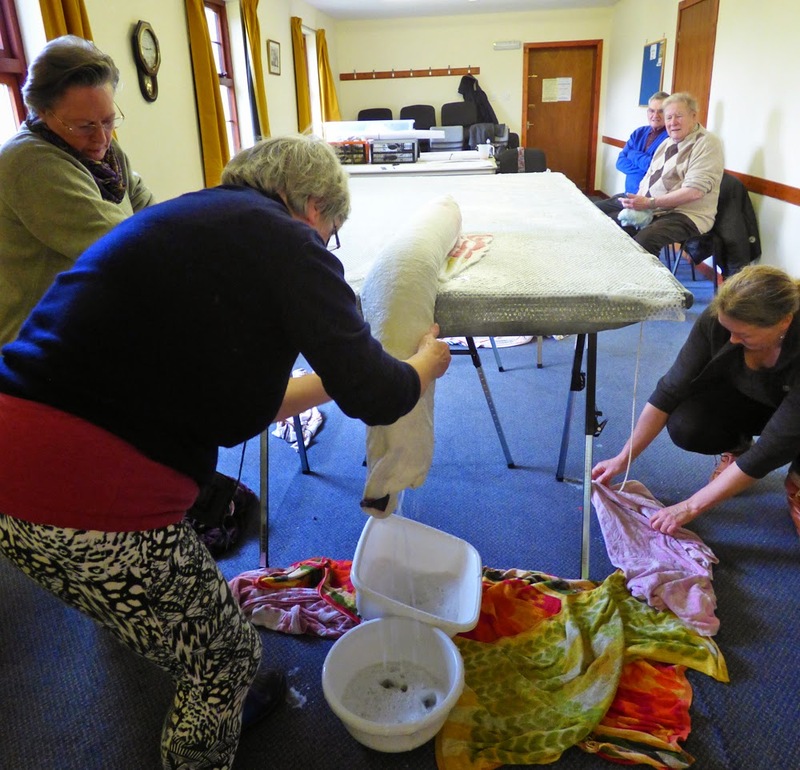 It is not really good practice to have our food and drink on top of the felt - but it was all on top of the sheets of polythene we were using to stop our clothes getting damp as we leaned on the damp felt. 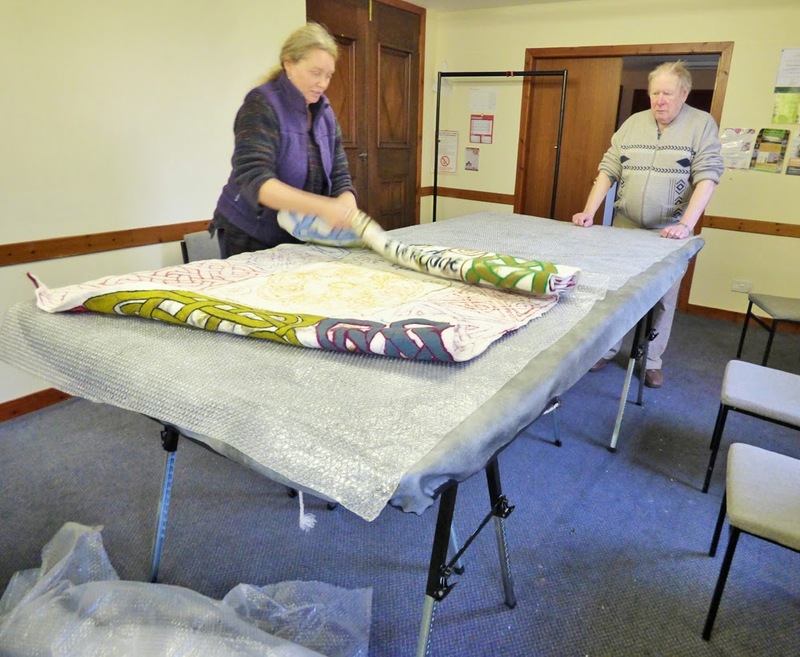 This was the day that is the normal meeting day for the whole of the Friendship Group so at lunchtime we had to dismantle the table and move it through to the main hall, leaving the smaller room free for the club meeting. 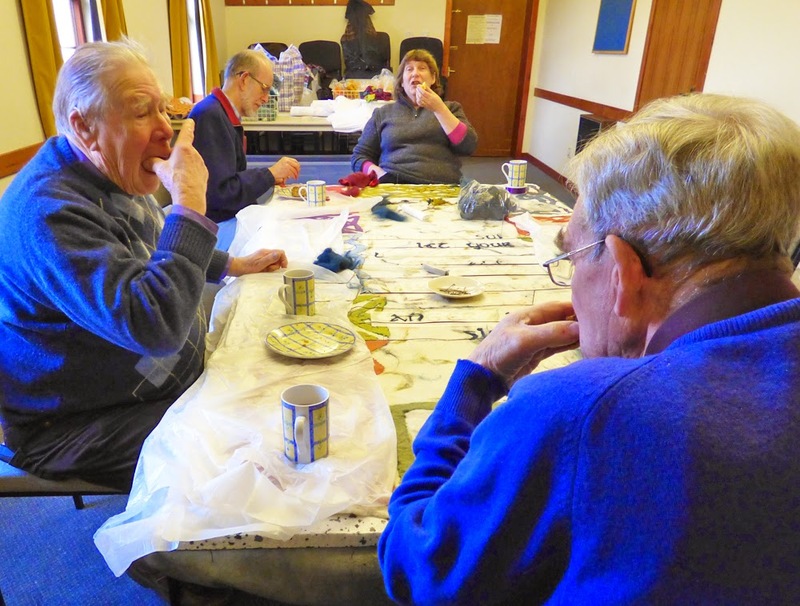 After some lovely lentil soup provided by Lynne and David we got it all set up again and invited the other members of the club to come and watch us at work - and indeed to join in. They seemed very interested to see what we were doing. The rest of the afternoon was spent doing more of the needlefelting detail. We were working a bit slower because it was colder in the main hall! 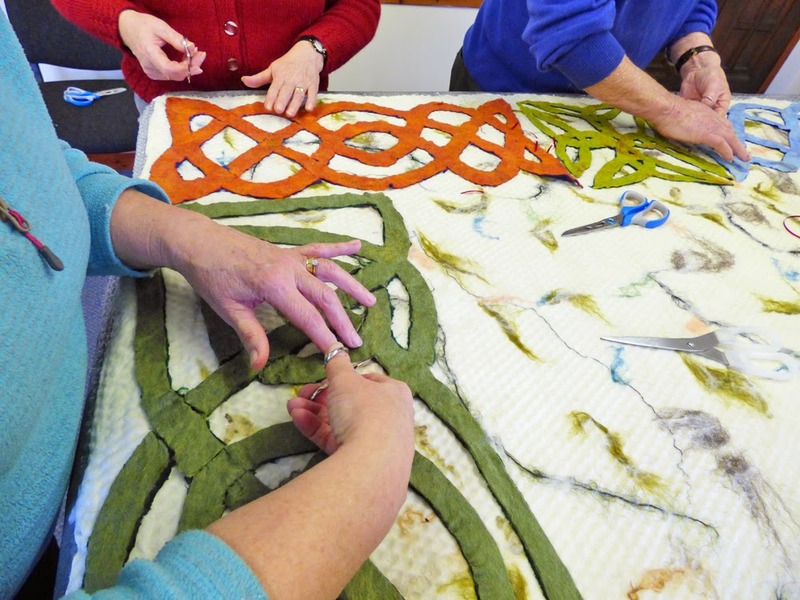 You can see from this photograph of one of the knotwork panels which had been part done just how worthwhile it is spending time needlefelting the detail. By the end of the session we were happy with progress and stood back to have a good look. To see all the other photographs have a look at the web album - click here. 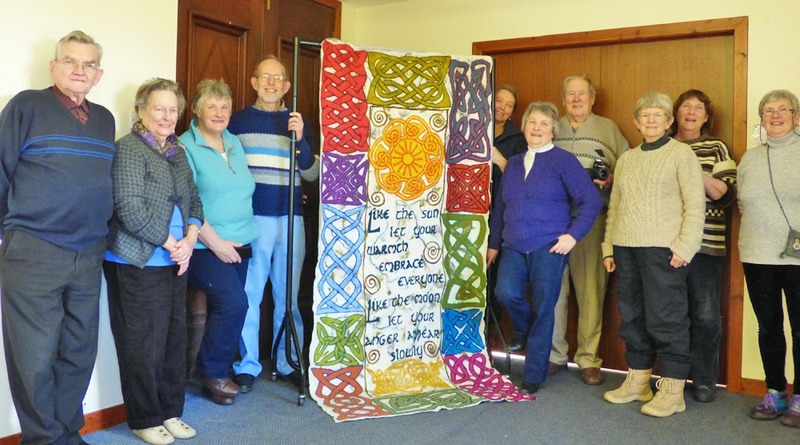 To read about the first wallhanging made by the volunteers from Groam House Museum, click here. Today was another squally day - nasty sleety rain, but interspersed with the occasional sunny spell. 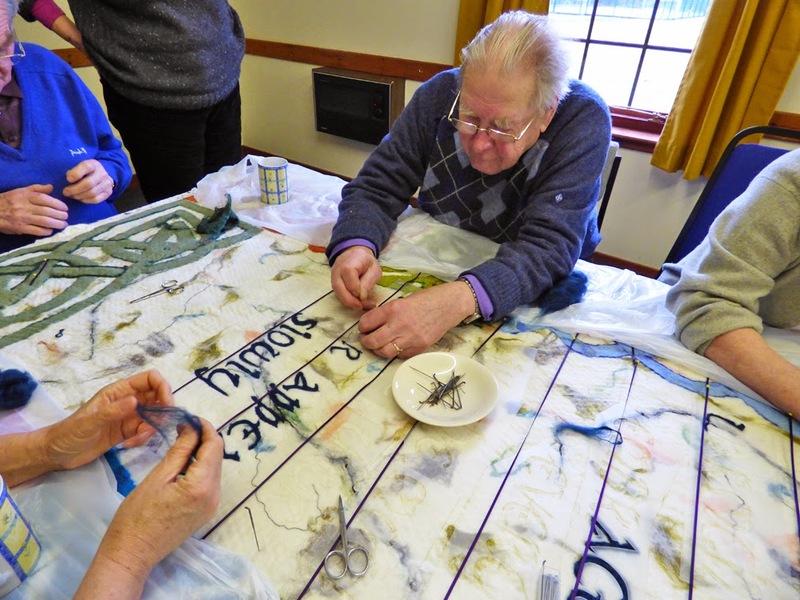 We got the table set up and the felt in place ready for the day's work which was more needlefelting ......... all day stabbing at the felt to add detail to our wallhanging. 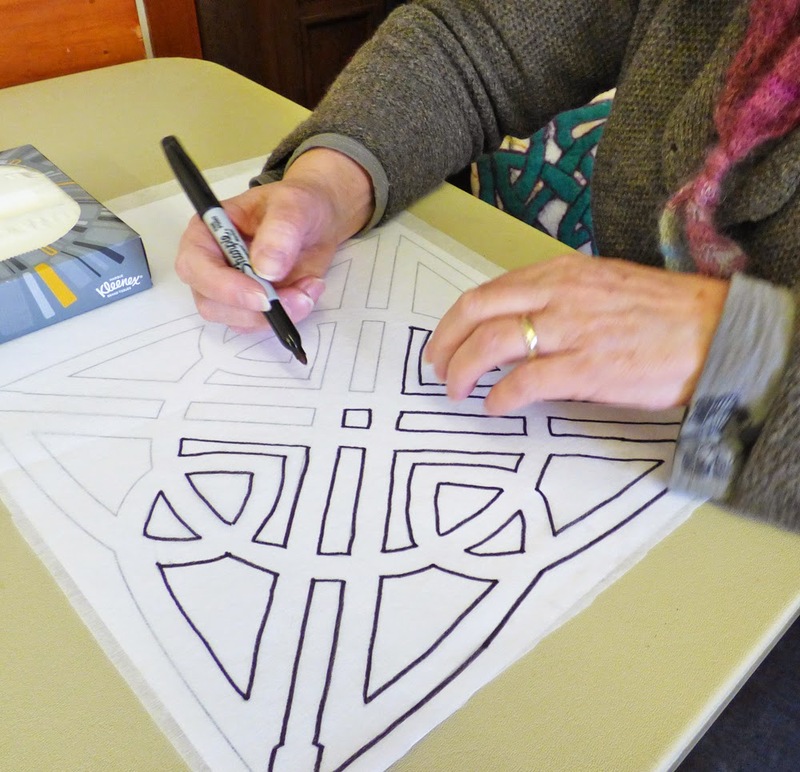 A task over the weekend was to cut out the designs for the two Pictish symbols that had to be added to the felt above and below the text. This was done on my laser cutting machine, but the felt for the Crescent & V-rod symbol was too thick and the cuts didn't go right through to the back. To complicate things, the laser cutter chose that time to break down! Fortunately it was a relatively simple fix - just re-soldering a broken wire. However, it meant the rest of the cutting had to be done by hand. We were joined today by my granddaughter, Rachel, who is in her final year at school and on Tuesdays comes to my studio for work experience. She spent the first half hour or so carefully cutting out the rest of the intricate Crescent and V-rod symbol. The particular design we chose is that on the large cross slab stone housed in Groam House Museum. The next step was to needlefelt both this piece and the piece for our sun disc symbol into place. 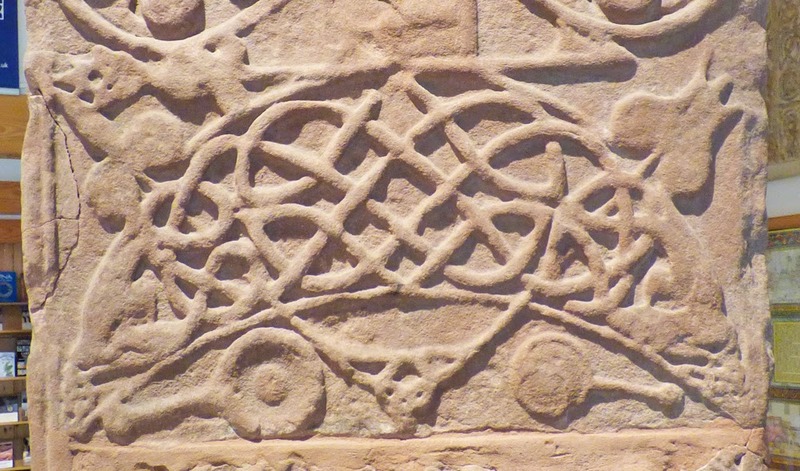 For our sun disc, we took inspiration from two sources - the Ardjackie stone that sits outside Tain Museum circled by a knotwork design from George Bain's book. It is hard to see the sun disc in this picture - some call it a spoked wheel. 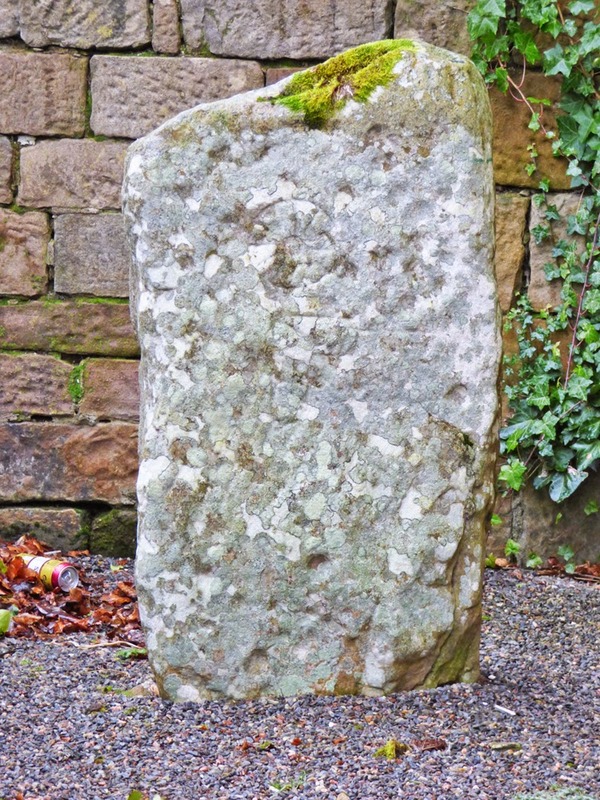 It is towards the top of the stone and slightly to the left hand side. Needle felting by hand is a slow process and the whole day was spent doing this. 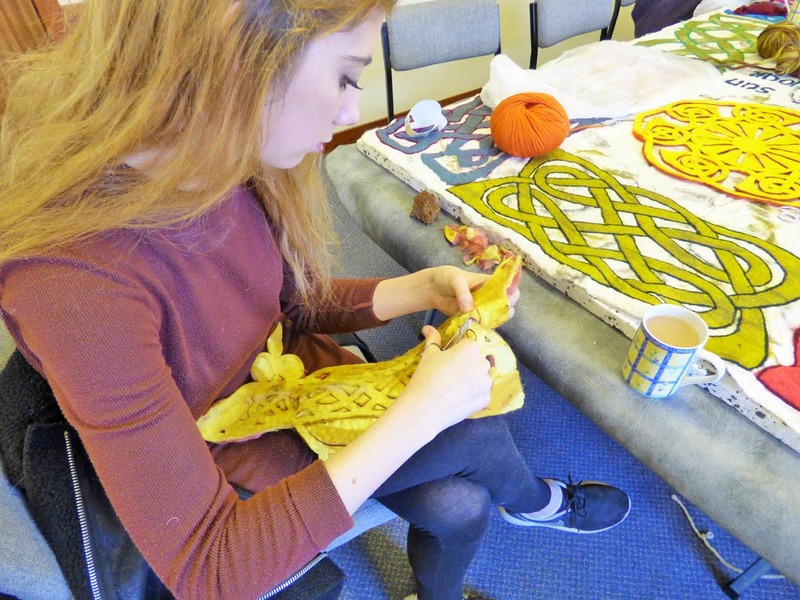 The pictish symbols had to be needled all over while the knotwork panels only needed to have the borders of the lines picked out in contrasting colours. Although time consuming, it was worth the investment of both time and energy. The other feature that had to be added was a border around our central section. 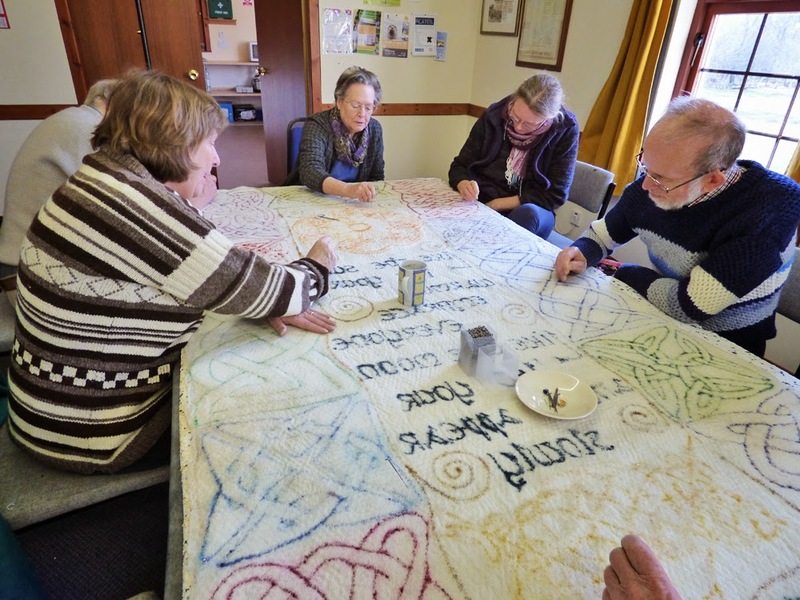 In amongst the text there were some blank spaces so we decided to fill them in with some spiral motifs using the same wool pencil rovings as the border line. Our energy levels were kept high through the day with the aid of a lovely Yorkshire Parkin baked by Clive - thanks! By the end of the day we had almost finished. We still have a little bit of detail to add to two of the knotwork panels, but it will only take another 30 minutes or so of stabbing at the start of our next session. 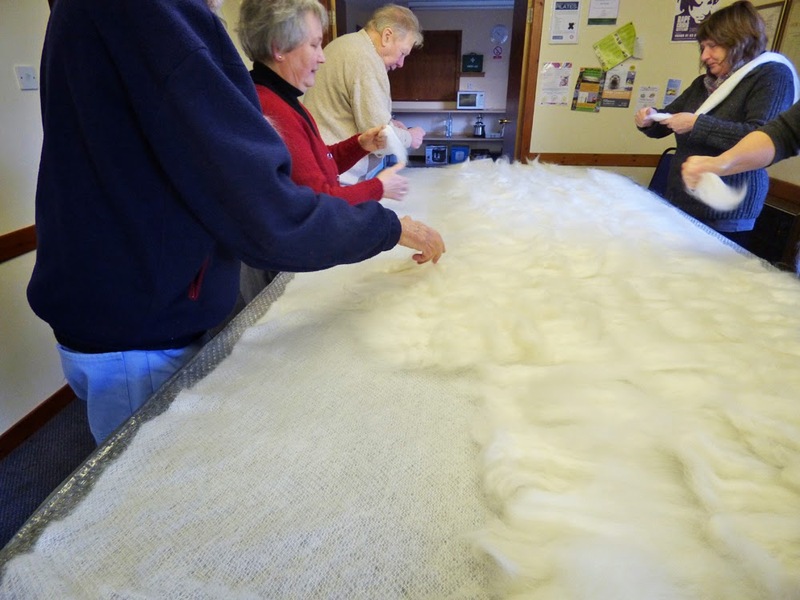 We had a quick check on the back to check that the fibres had fully penetrated, then we cleared the felt of loose fibres, broken needles, polythene sheets etc. before taking a photograph. 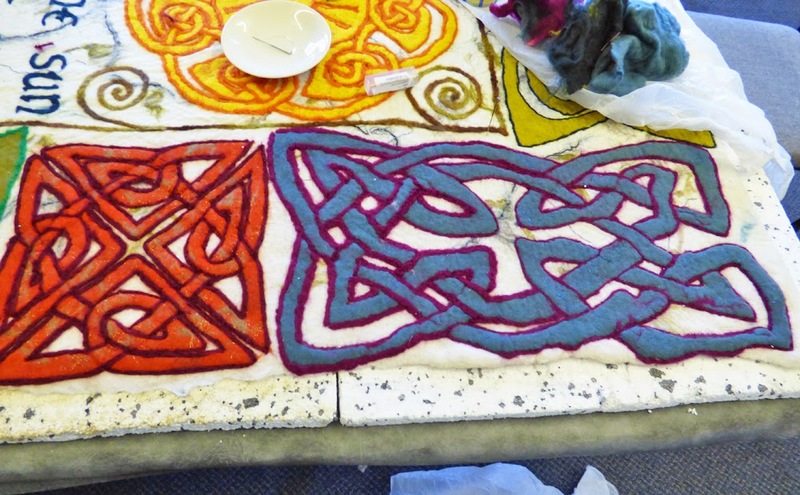 I have put a lot more pictures on the web album including a close-up shot of each knotwork section - click here to see them. The day dawned fair and bright - clear blue skies and just a gentle breeze - a promise that spring might be just around the corner. It didn't last! However, we did get all the gear transferred from the car into the hall in good weather. and then after that it was just general stabbing with the felting needles. 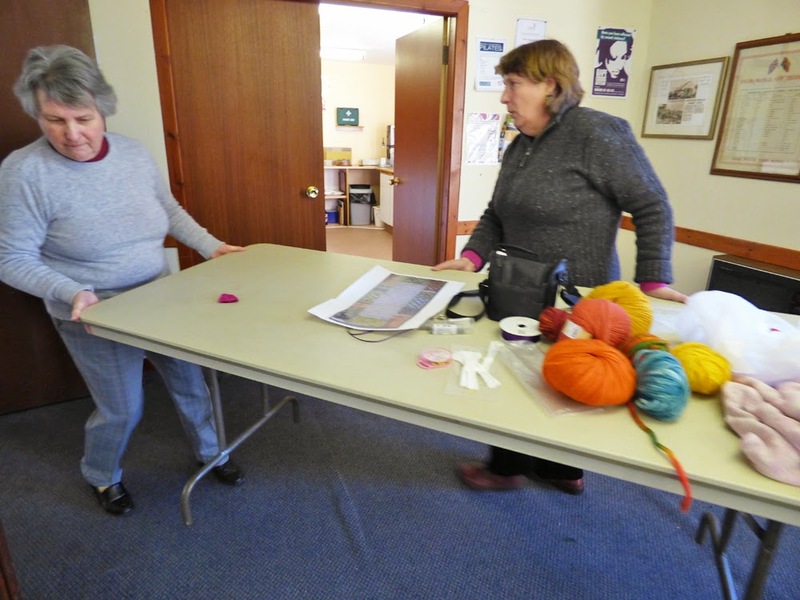 We wanted to go over all the needlefelted areas to ensure that there would be no little bits that might come loose over time. Clive had baked us another lovely cake - orange and almond this time - and that kept us going while we stabbed away. I have finally figured out how to transfer movie clips from my camera to the computer so I took a few short bursts of video. It gives you a flavour of how our group worked - not much concentration needed on this occasion so conversation was free-flowing. - click here to see the video. After about 45 minutes of stabbing on the front - and occasionally checking how much was coming through to the back, we turned the felt over and gave it the same treatment from the back. This ensures that everything would be fully held in place for the final stage. 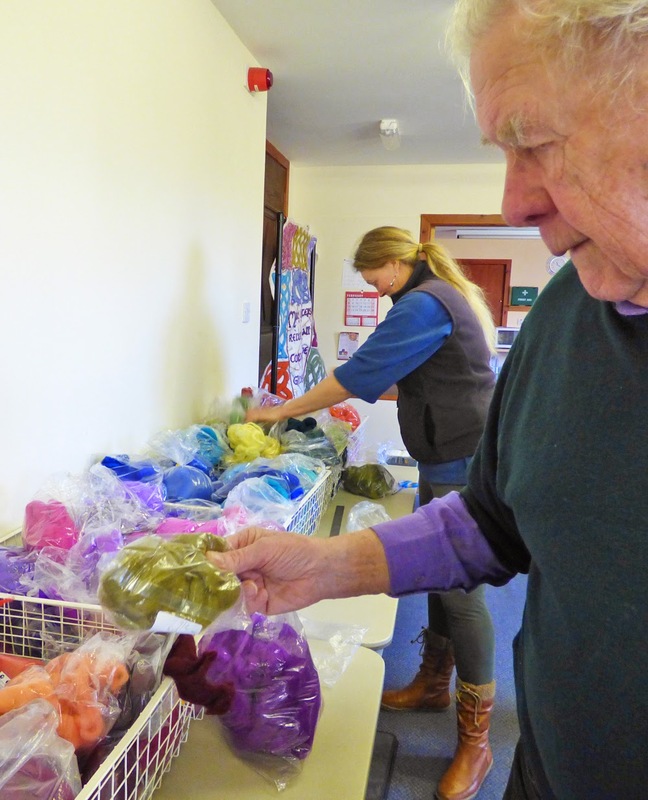 Lunch consisted of another lovely soup provided by Lynne and David - broccoli and stilton - plus whatever people had brought in the way of sandwiches etc. 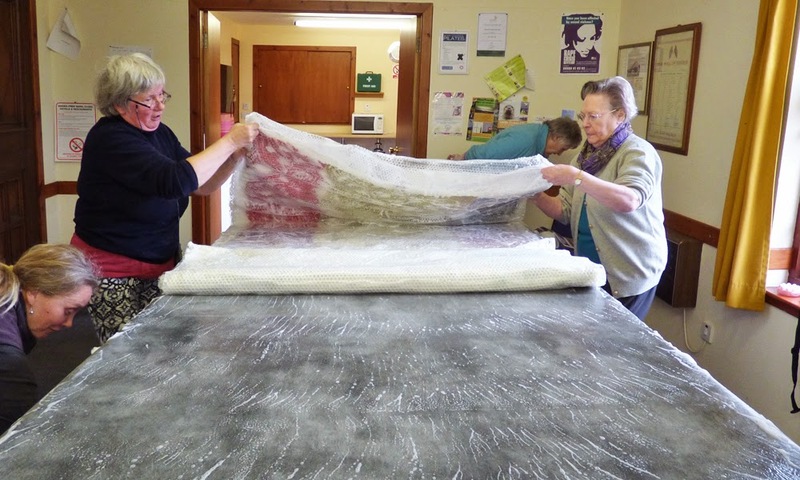 Then we re-built the table at standing height, covered it with bubblewrap, then our felt. 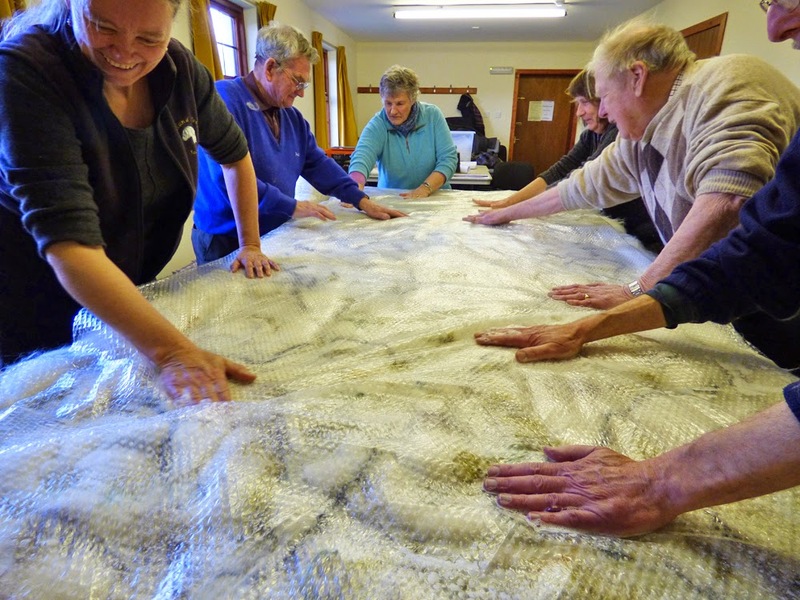 We poured on about 10 litres of hot soapy water then put the second layer of bubblewrap in place and rubbed.... and rubbed... and rubbed. and repeated the procedure on the front. 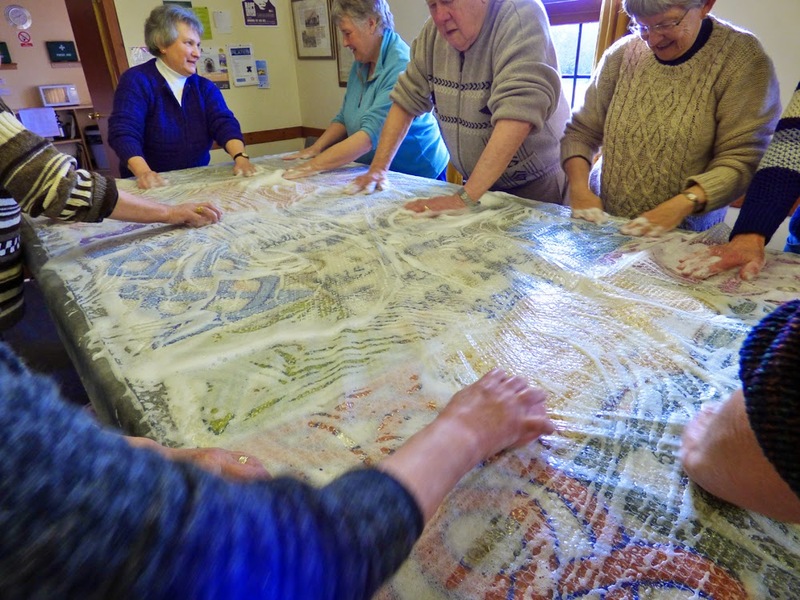 We probably spent about an hour doing this final rubbing session and then it was time for the serious physical effort - the felt has to be rolled. 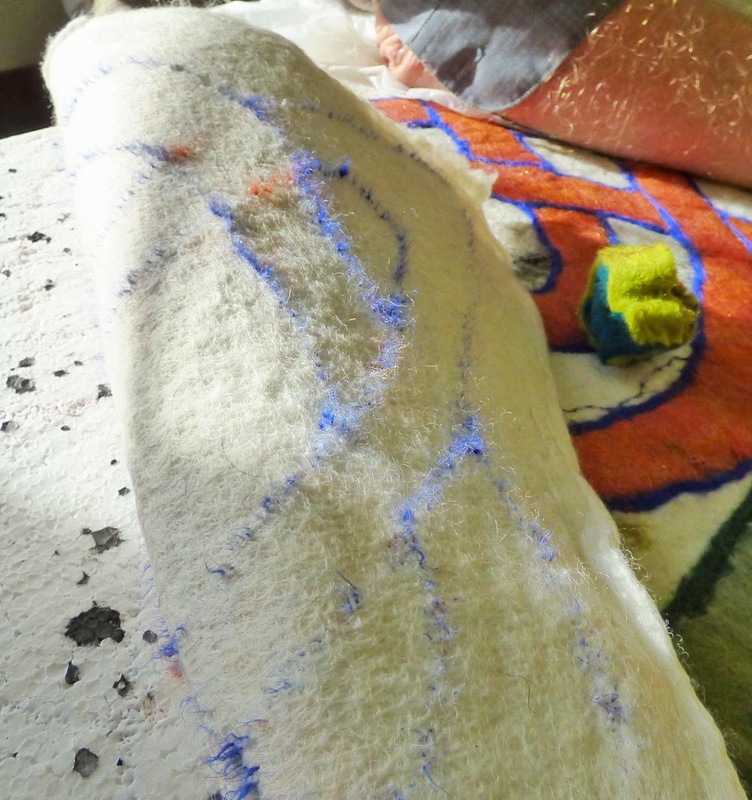 Felt will always shrink in the direction of rolling, so it needs to be done in different directions. We started working from one end using two four foot wide blinds end to end, and worked in pairs, good strong rolls to a count of 50 before opening out and rolling from the other end - repeated four times. The widest bamboo blind I have ever been able to find is 6 feet wide, so when rolling across the width of our four feet by eight feet piece we needed to use two blinds side by side, and to stop the roll bending and falling apart, this was supplemented by two four feet wide blinds on top of the felt - a rather fat, unwieldy roll but our teams of 4 handled it admirably. again rolled first from one side and then the other. 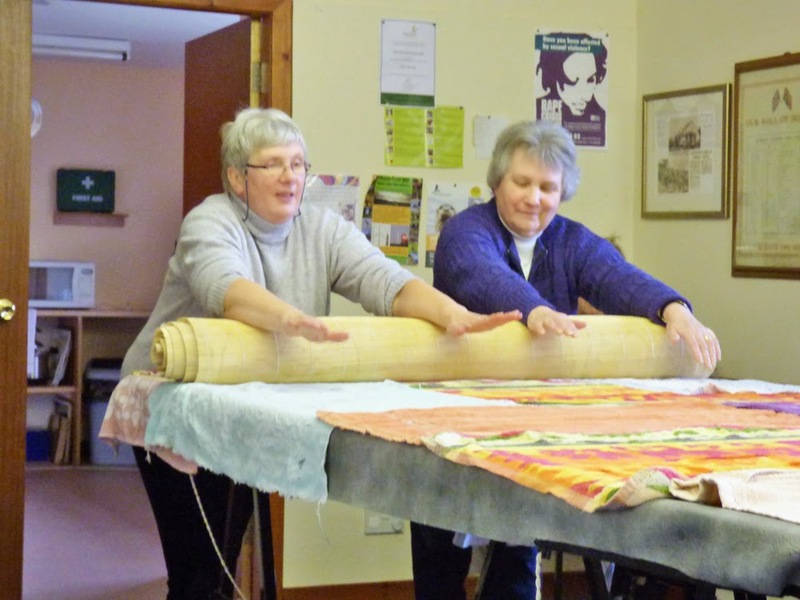 By the time we had done all this rolling, we had brought the width down by about 4 inches and the length was reduced by 6 inches. Then it was time to stand back and admire our handiwork. We pinned a fabric tube onto the back of the top edge into which we slid the top bar of a clothes rail. It is not quite tall enough but it stills gives a better impression than when it is lying flat on the table. 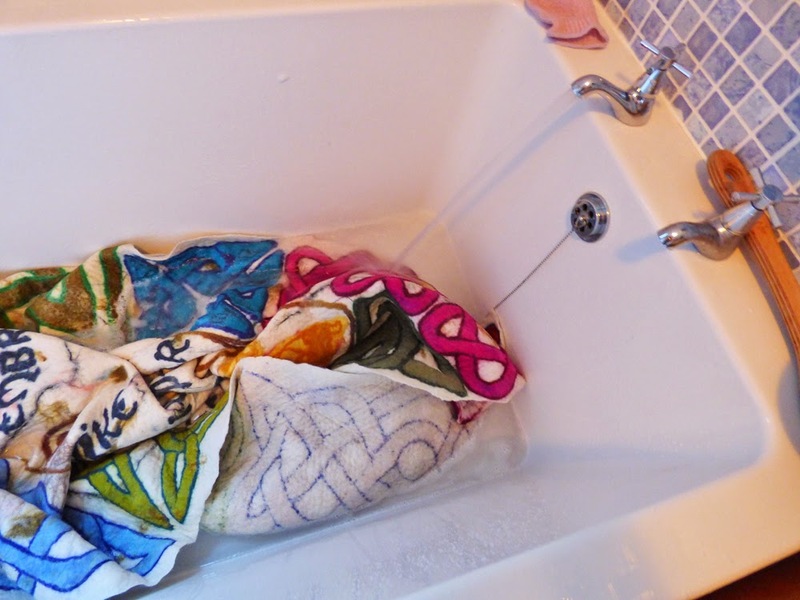 This had to be done at home as it needs a bath to rinse out all the soapy water. A piece of felt this size is quite hard to work, and very heavy when it is soaking wet, so the easiest thing is to paddle it in the bath with my feet. It took 4 bathfuls of hot water before it was running clear. As each rinse was squeezed out I could feel the felt firming up - a sure sign that everything had gone according to plan. It dripped into the bath overnight and then the next day - once again bright and this time a good breeze - we spread it out over the table in the garden and let it dry off some more, then a final hanging up over the banister until it was fully dry a couple of days later. 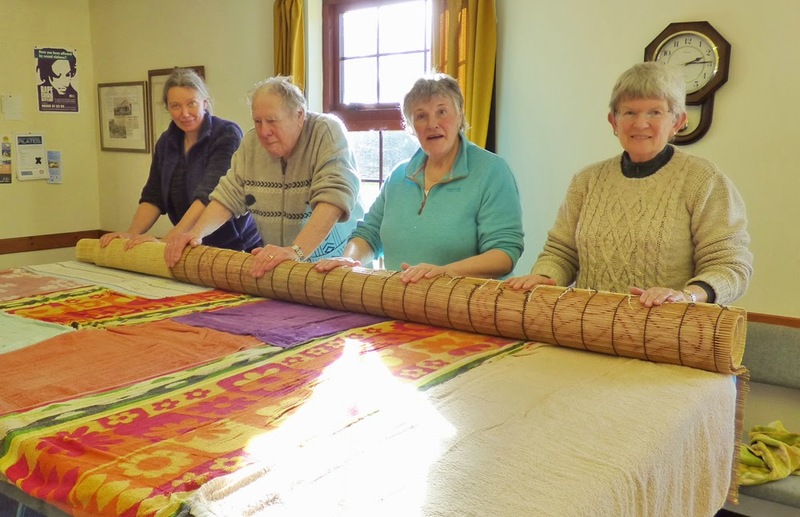 This will eventually go on display along with the panel made in January by the volunteers from Groam House Museum and with the three that have still to be made. Watch this space........! 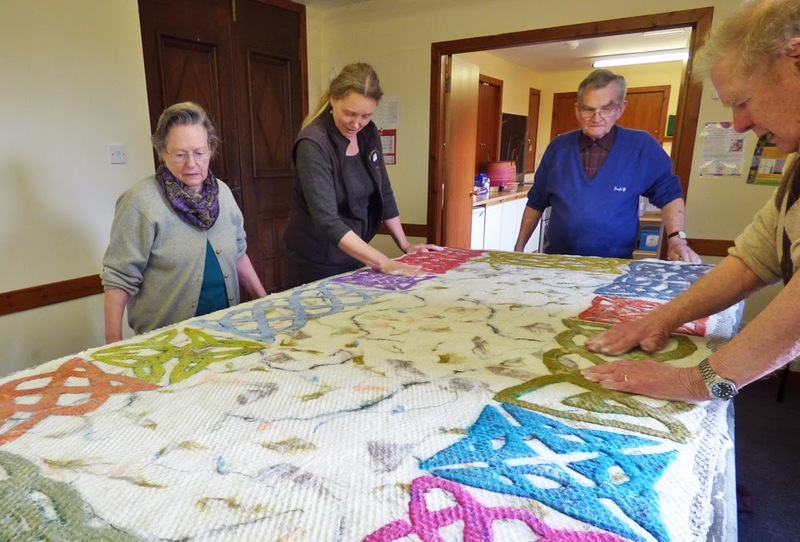 To read about the first panel in the series - made by the volunteers of Groam House Museum, click here. 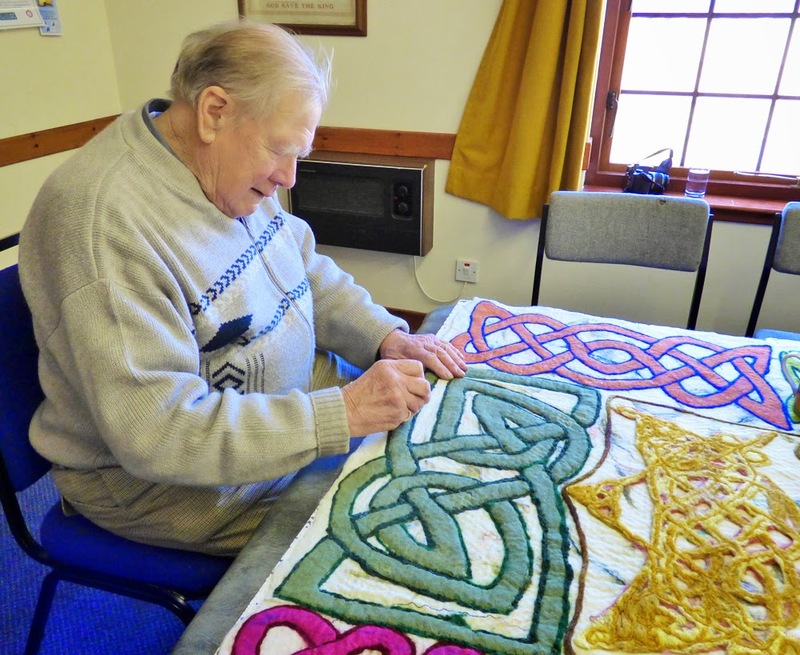 To find out more about Groam House Museum and the work of George Bain, click here. To view more photographs from this project, click here. Did you enjoy reading about this? 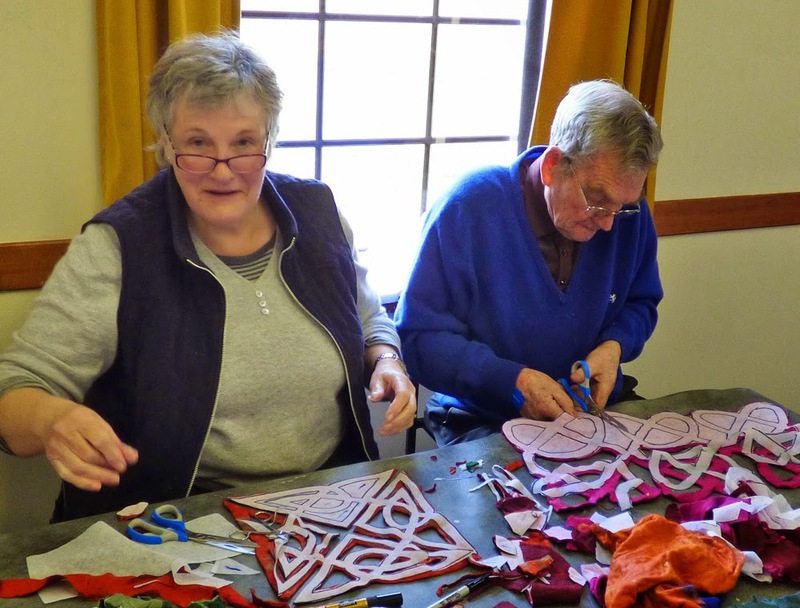 - or if you are one of the participants, did you enjoy making the felt? - please give your comments by clicking in the comments space below.